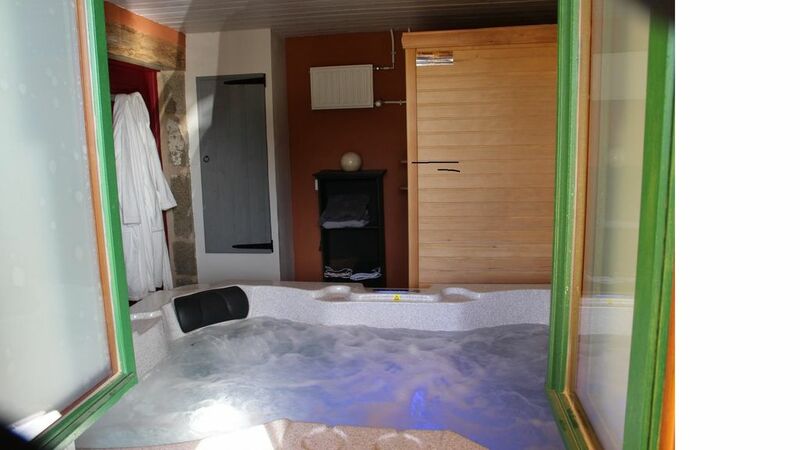 Detached house, with fenced 200 m², which offers multiple leisure on site: jacuzzi and sauna. Possible activities in the neighborhood: fishing in river (about 10 km) or in communal pond. Swimming at 9 km: pond of Masmangeas. Qualified lodging "écogestes": ecological insulation, biological painting, maintenance of the SPA with natural products. Ground floor: kitchen, living room, lounge (wood stove), shower room, WC, wellness area including a 4-seater jacuzzi and a 2-seater sauna overlooking the garden. CH2: 1 double bed with private bathroom, separate toilet. Mezzanine with baby foot. Central heating with pellets and solar panels. Terrace with 4 sunbeds. Outdoor children's games: swing, sandbox. Included in the price of the stay: sheets, heating (wood and pellets). Baby equipment available. Towels: 6 € / person / stay. Weekend rental possible outside July and August.